We live in a world of screens, and in this digital age full of so many devices and distractions, it’s become one of the things parents worry about most: How much time should kids spend staring at their phones and computers? When it comes to technology use, what’s the right balance between privacy and self-discovery? Research continues to provide answers on how parents are navigating this world with their children. A recent study that looked at nearly 2,000 parents with kids ages 8-18 found that people with children spend, on average, 9 hours and 22 minutes per day in front of a screen. This includes texting, tweeting, Googling, checking the weather, reading email, playing games, and more. Despite devoting such a large chunk of their day to technology use, 78% of those parents told the researchers that they are modeling good media habits for their kids. One of the report’s biggest takeaways is that screen time isn’t going anywhere. 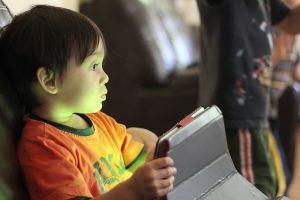 To get the best recommendations on technology use guidelines for kids, we looked at the rules that four different screen time experts set in their homes for their own children. Research pediatrician Dr. Jenny Radesky, in addition to recently revising the guidelines on media and children from the American Academy of Pediatrics, is also the mother of two young boys. Her household is far from tech-averse; the Radeskys have a large flatscreen television in their living room, and both parents have smartphones. Radesky also has a pager she must keep turned on and nearby when on call for work. For her children, she has instituted the rule of having no technology use for media on weekdays while the boys are in school. The family also unplugs at family dinner and before bed. On weekends, the kids can watch cartoons, use apps, and play video games, but Radesky is sure to keep an open dialogue with her children about the media they consume. For example, she makes it a point to talk to her son about being aware of how he reacts to video games or how to interpret information found online. Lauren Hale is a sleep researcher at Stony Brook University in New York, and she draws from over a decade of personal research to create her house rules on technology use. Hale says that as both children and adults watch or use screens with blue light shining in their eyes and close to their faces, the body’s natural sleep functions are delayed. This means it takes longer to fall asleep, and both sleep quality and total sleep time are affected. Hale has two young children for whom she strictly enforces the following rules: no screens during the hour before bed, no screens in the bedroom, and no screens as a part of the bedtime routine. Although these rules are for Hale’s children, it’s definitely not a bad idea for adults to try to follow these rules, too. Canadian pediatrician and founder of the Childhood Obesity Foundation Dr. Tom Warshawski has been involved in encouraging parents to cut back on media time for their children for years. He promotes the daily 5-2-1-0 formula, which translates to 5 servings of fruits and veggies, no more than 2 hours of screen time, 1 hour of physical activity, and 0 sugary beverages. As his two children were growing up, Warshawski limited television time to just one hour on weekdays, and only after all homework had been completed. Video games were completely outlawed. Warshawski has said that both of his children, now adults, have thanked him and his wife for making and sticking to these rules. Douglas Gentile, a professor at Iowa State University and a prominent researcher in the area of media violence, has two nearly grown daughters of his own. When they were younger, Gentile was sure to follow the basic national guidelines on screen time of one hour per day in elementary school, increased to two hours as they grew up. Gentile was always much stricter about media content than screen time, however. Rather than relying on ratings, Gentile was sure to preview all media himself before allowing his daughters to see it. He says that these rules helped his daughters develop their own good judgement on what kinds of media they would and wouldn’t enjoy and value.